I'm not writing this article so that you'll pierce any part of your body or that you'll change your mind about this piercing or another. All I want to do by writing this is share my experience and knowledge about the septum piercing. I've had my septum pierced for three months now. The septum is the tender part of skin below the cartilage of the nose between the nostrils. I think that's a really beautiful place to have a piercing - if you get a subtle or not too big piece of jewellery. You know, wearing a doorknocker is not my cup of tea ! I've had several questions about this piercing and I'm going to tell you everything about this mysterious, weird and fun piercing. SEPTUM PIERCINGS ARE OLDIES ! 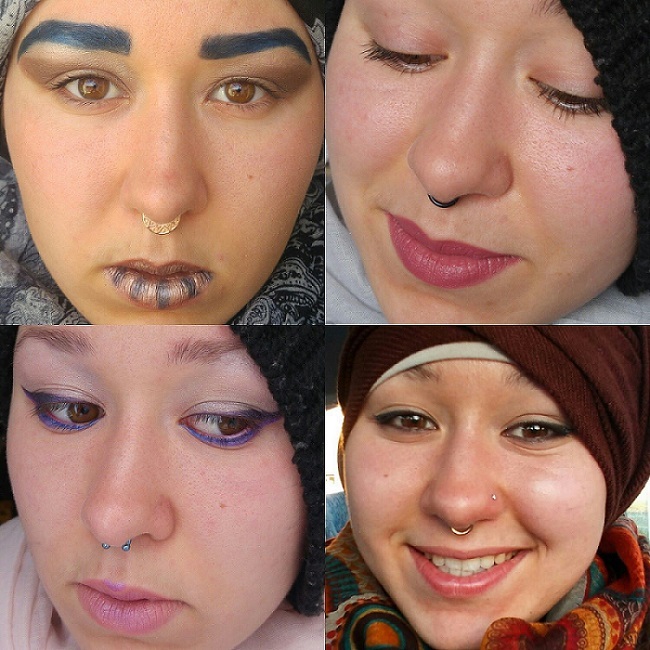 Like all body piercings, the septum piercing has tribal origins before being fashionable. Papuans of New Guinea in Oceania are the ones that wear this piercing the most. I guess many more other primitive peoples wear the septum piercing as a warrior or rank sign.Anyways, the first time it was really shown off was by the designer Riccardo Tisci during the Fall/Winter 2012/2013 Givenchy show. He had the models parade with oversize fake septum piercings. Little by little, this fashion contaminated celebrities such as Madonna, Rihanna, Lady Gaga, Jessica Biel, Zoë Kravitz (Cinna's daughter !)... and then contaminated us and the nostrils of classic styles as well as quirky ones. I'd been told and had read off the Internet that this was going to hurt and that given there are nerves in the nose, I was going to shed a tear. Well, not only did that not hurt at all but I shed this one tear only when the piercer (Virgo from VIP Piercing in Troyes) set the clamp in my nose because it hurt a bit. Piercing this part of the body goes just as quickly as piercing any other. Setting the clamp does take some time though : given where the piercing is done, it's not possible to have a mark to know exactly where the blade is going to go. Being sure the piercing will be straight takes time. It went so fast that it didn't hurt at all. Almost no blood, just a few drops that the piercer cleaned and then it was all over. In a nutshell, I was a huge pain for 10 minutes and it didn't even hurt at all. Not that I would've liked that. WHAT KIND OF JEWELLERY IS AVAILABLE FOR A PIERCED SEPTUM ? WHERE TO BUY SEPTUM PIERCINGS ? 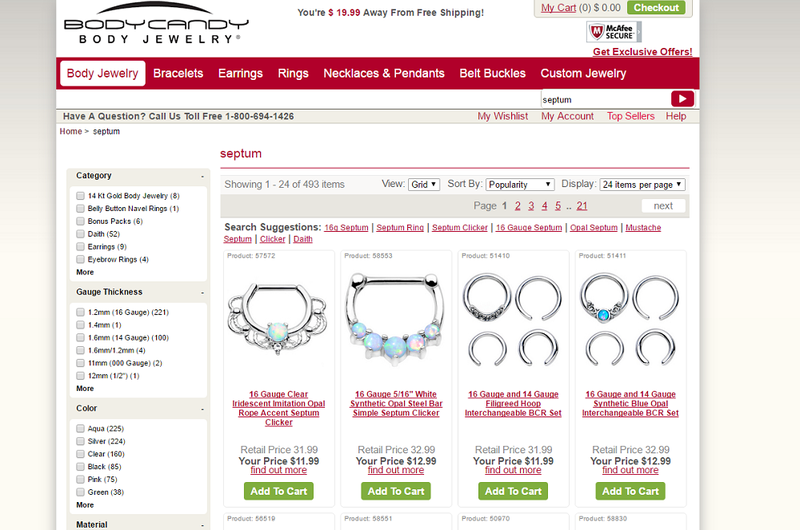 Almost any online piercing website sells circular barbells or rings. If you don't go for a clicker ring, you may need clamps to open and close the ring when you want to wear it and take it out. Crazy Factory : I've bought a whole lot of piercings on this website lately (I'll publish the haul later) and the shipping fees are free when you order for over €19. FreshTrends which design is beautiful ! Their selection of piercings is large and they're lovely ! The shipping rates are exceptionnally low when it comes to France whereas they're based in the USA. BodyCandy which jewellery is sometimes similar to FreshTrends' and sometimes a bit more expensive, but still really beautiful. 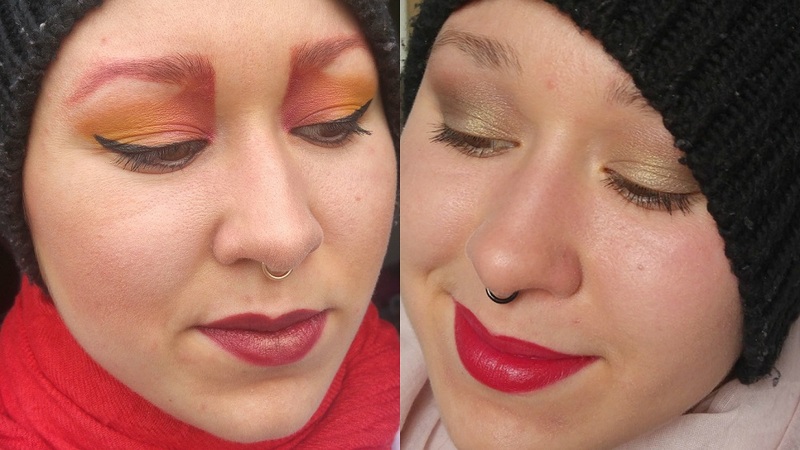 Last but not least, you can find really amazing and original septum piercings in many Etsy stores. They're more expensive but they're worth the price, check out for instance RebelOcean or AliceRubyStudio. Vintage or handmade, these stores have a good thing going on ! HOW MUCH IS A SEPTUM PIERCING ? That's one of the most expensive body piercings. I've been to VIP Piercing in Troyes (France) and I've paid €65 with a circular barbell as a healing piercing. This piercing studio has a really good reputation. In another piercing studio, still in Troyes, it costs €60 and they'll put in a banana as a healing piercing. The price is quite the same anywhere if you go to a professionnal piercing studio with a good reputation. You're going to get a hole in your body, that's no joke ! No one wants to share somebody else's AIDS ! WHY WOULD YOU GET A SEPTUM PIERCING ? Because. That's not a piercing that's always easy to wear, especially if you choose to wear a big clicker ! I guess that's the same thing with anything : if you're wearing bright orange pants outside, you're bound to catch people's attention ! Everyone knows how easy and convenient it is to hide this piercing in one's nostrils. However, I'm still thinking that these days, body peircings are more of a disposable fashion than a sign that you belong to a group. It's an adornment, but nothing much more than an adornment. Do you have a pierced septum ? What do you think of this fashion ?